Polycythaemia (Rubra) Vera, also known as primary polycythaemia vera, is a disorder where too many red cells are produced in the bone marrow, without any identifiable cause. These cells accumulate in the bone marrow and in the blood stream where they increase the blood volume and cause the blood to become thicker, or more 'viscous' than normal. In many people with polycythaemia vera, too many platelets and white cells are also produced. Polycythaemia vera is a rare chronic disease diagnosed in an estimated 2 to 3 people per 100,000 population. Although it can occur at any age, polycythaemia vera usually affects older people, with most patients diagnosed over the age of 55 years. Polycythaemia vera is rare in children and young adults. It occurs more commonly in males than in females. If symptoms do develop, they tend to do so over time. . They are mainly due to the increased thickness (hyperviscosity) and abnormally high numbers of blood cells in the circulating blood. Common symptoms include headaches, blurred vision, fatigue, weakness, dizziness, itchy skin and night sweats. Blood clots are a common complication of polycythaemia vera and occur in around 30 per cent of people, even before they are diagnosed. As the blood is thicker than normal it cannot flow as easily, especially through the smaller blood vessels. If left untreated, this increases the risk of thrombosis, the formation of a blood clot within a blood vessel. Blood clots can form in various parts of the body including the deep and superficial veins of the legs, in the heart (causing a myocardial infarction or heart attack) and in the brain (causing a stroke). Older people and those with a history of a previous blood clot are at increased risk. A major aim of treatment in polycythaemia vera is to maintain a normal blood count and reduce your risk of thrombosis. 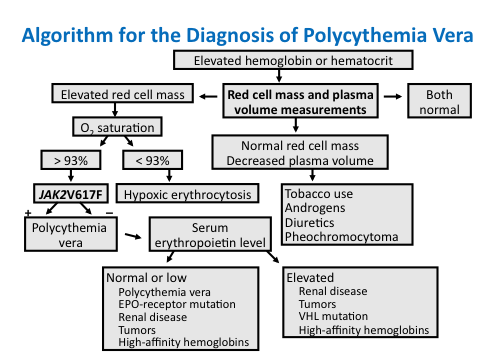 JAK2 mutations (particularly the V617F mutation) can be found in more than 95% of people with Polycythaemia vera. This test can be performed on a blood sample and will help to confirm the diagnosis of a myeloproliferative neoplasm. It doesn't help distinguish polycythaemia vera from essential thrombocythaemia or primary myelofibrosis. Venesection (or phlebotomy) is a procedure in which a controlled amount of blood is removed from your bloodstream. 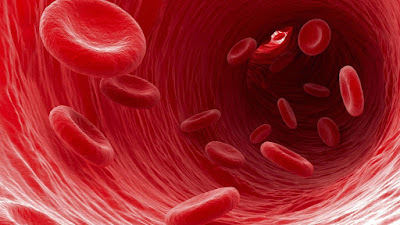 This procedure is commonly used when people are first diagnosed with polycythaemia vera because it can help to rapidly reduce a high red cell count. In a process similar to a blood donation, 450mls to 500mls of your blood is removed, usually from a large vein in the arm, inside the elbow bend. This is usually done in the outpatient's department of the hospital. It takes about 30 minutes to complete. You will need to have a blood test before to check your blood count, and you must make sure you drink plenty of water before and after the procedure. Interferon is a substance produced naturally by the body's immune system. It plays an important role in fighting disease. In polycythaemia vera, interferon is sometimes prescribed for younger patients to help control the production of blood cells. Interferon is usually given three times a week as an injection under the skin (subcutaneous injection) using a very small needle. You or a family member (or friend) will be taught how to do this at home. A weekly injection is now available and is becoming more widely used. Anagrelide hydrochloride (Agrylin�) is a drug used to reduce high platelet counts in people with polycythaemia vera and essential thrombocythaemia. Anagrelide affects platelet-producing cells in the bone marrow called megakaryocytes, slowing down platelet production and therefore reducing the number of platelets in the circulating blood. This can help to reduce symptoms and the risk of clotting complications in the future. Although anagrelide lowers platelet counts to more normal levels, it does not affect the body's natural process to form a clot when needed. Anagrelide is taken in capsule form by mouth. It can be taken with or without food. The capsule strength and the number of times a day you need to take anagrelide will depend on your platelet count, your response to treatment and how well you tolerate the drug. You should report any side effects you are experiencing to your doctor as many of them can be treated to reduce any discomfort to you. You need to contact your doctor immediately if you experience the following symptoms: shortness of breath or difficulty breathing, swollen ankles, fast or irregular heartbeat, and / or chest pain. In addition to the treatments described above, your doctor will advise you on ways to stay healthy and reduce any 'life-style' factors that might increase your risk of thrombosis. For example you may be advised to stop smoking, and/or take a series of steps to maintain a healthy weight range and blood pressure. Treatment during this time is supportive and involves making every effort to improve the patient's quality of life, by relieving any symptoms they might have and by preventing and treating any complications that arise from their disease or its treatment. This may involve blood transfusions if required, pain relief and careful myelosuppression.